Dec 2106 : UTMOST is hunting for Fast Radio Busts — FRBs — mysterious flashes of radio energy which last only for a few milliseconds which appear to have come to us from billions of light years away. The telltale sign that the bursts come from so far away is the “swept signal” they show. 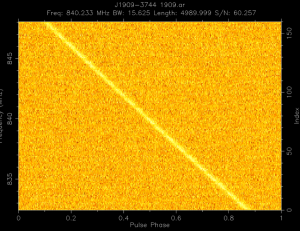 For FRBs, this is seen as the higher frequency radio waves arriving at the telescope before the lower frequency waves. In swept radio signals from FRBs, higher frequencies arrive at the telesocpe detectors before lower frequencies do — with a delay of as much as a second or more. Presently, this effect — known as the FRB “dispersion measure” — is our best means of estimating the distance to the source. As a direct consequence, better frequency resolution at the telescope means that we are able to detect FRBs with higher dispersions more easily. UTMOST has spent the last two months upgrading its frequency resolution by a factor of 8 — a very significant improvement which could improve our ability to detect FRBs by a factor of 2 or 3 — depending on their intrinsic properties. Congratulations on the huge effort by Andrew Jameson and Tim Bateman to get this new mode of operation rapidly written and commissioned during the last two months.